Thanks to a generous donation from Nike, the Kobe and Vanessa Bryant Family Foundation (KVBFF) raised $20,000 for programs encouraging young people to stay active and engage in sports. KVBFF auctioned off eight sets of the Kobe Prelude Pack at the Nike Vault at STAPLES CENTER. The proceeds from the auction will benefit Kids in Sports, which provides high quality, affordable sports opportunities for more than 8,000 underserved youth in Los Angeles, while encouraging community and family involvement. KVBFF’s support of Kids in Sports is part of the Foundation’s excellence through sports programming, which will continue to expand throughout 2014. 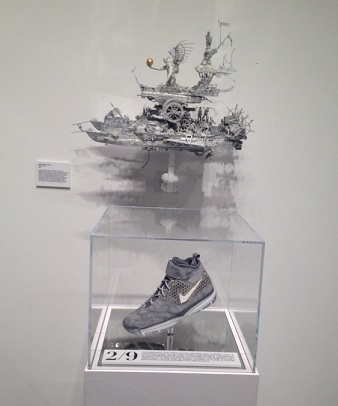 Each of the Kobe Prelude Pack shoes was displayed at Nike Vault along with a piece of art commissioned by Nike to represent a moment in Kobe’s illustrious career. Its good if this foundation will also provides support to children who are funs of Kobe Bryant her in the Philippines who are also funs of playing basketball.